A unique exhibit is currently on display in Evansville. It stems from a summer camp at Western Kentucky University designed to teach students the history of the Holocaust. Several people gathered at the Temple Adath B’nai Israel to hear on Jewish man’s story about his family fighting to stay alive during World War II. Helping today’s generation by sharing his past is the goal of author Fred Gross. 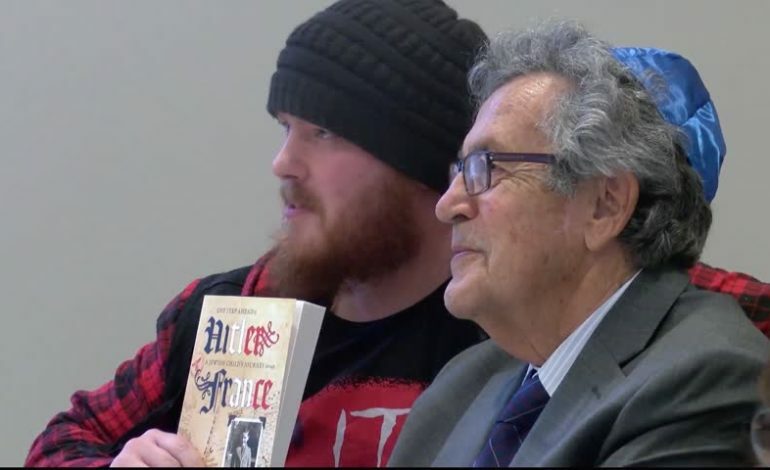 Gross was a guest speaker in Evansville Sunday to share his story about his family’s journey through France trying to stay one step ahead of Adolf Hitler and the Nazi Army. Gross’s visit is part of a nearly two-week exhibit displaying murals on the History of the Holocaust. “I think the general public recognizes that a survivor is something that’s special, but also, a survivor is something they might never get to hear again,” said Ron Skillern, an instructor at Western Kentucky University. One educator that bases some of her class work on the Holocaust says it’s important to remember and study these events to learn from the mistakes of the past hopefully. “There’s a lot of hate in the world,” said Rebekah Hodges, a teacher at Thompkins Middle School, “and I think some of it … kids nowadays are really aware of it and sometimes get involved in it. Hearing first-hand accounts from those that lived through history is always a benefit to the kids who are learning. “Students love the opportunity to have a survivor speak,” said Skillern. “They do view it as something that is very unique and very special. Visitors had the chance to leave comments about their experience during the day. Grudzinski says she wrote down every word that Gross said and looked forward to sharing with her student what she learned. “They’ll be very interested,” she said. Although the murals have been across Kentucky, Skillern says this is the first time they’ve been on display in Indiana.